To prepare a Sauce, for [haesfil] calves heads, or for cods head and shoulders, and for scotch collops. thanks a good pieces of beef, and boil it for your [grauoy], than put in a bunch of winter savory and tune, and a whole onion, a little whole peppers, a little lemon peal, an anchovy or two, and when you have it done, take it and boil it well, and then train it off, and then take the Oyster and seato then, in there onion liquor: and then work your butler up with Flour, and boil it up in your gravy well: put in a little by your Oyster, great a little Nutmeg and put in, then put in a little of your Manger liquor, and a little of your Ketchup: if you please to have it White, put in a little squire wine, if Red a little Claret, which you like curl. To Stein a Rump of Beef Whole. Take it and put it into a pot until it be about half boiled, then put it into a stein-pan core a chalk-coal-lire: then put in as many quarts of claret as of the liquor your boil it in, both alike, until it is almost cover'd, and as it stoves, put in a bunch of sweet herts and a whole onion, with a little cloves, Mace and sliced. 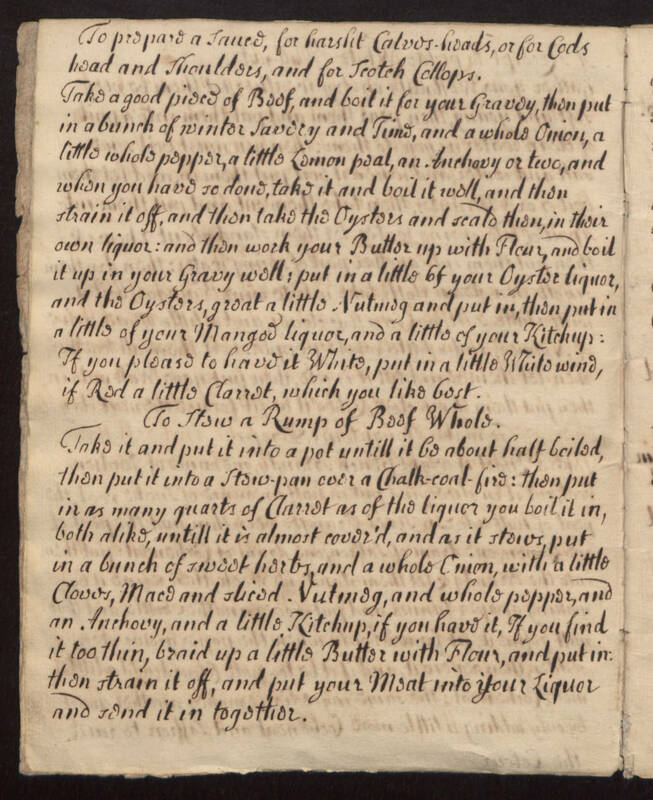 Nutmeg, and whole pepper, and an Anchovy, and a little Ketchup, if you have it, if you find it too thin, braid up a little Butter with Flour, and put it in; then strain it off, and put your meat into your liquor and send it in together.